This is Elvis Unlimited second book, and already now they get the hang of it. After viewing the first release, Shot By Bonja I awaited this released with some apprehension. Their first release was nice enough - several good pictures from Ed Bonja in colors - but the production revealed several failures, most likely due to hurry! So when the first book told us that the second would come only a month later, I got "worried". Unlimited used three more months than planned and the outcome is obvious! This new book is close to faultless! Congratulation! One must also say that Keith Alverson show us better images than Ed Bonja did. Keith really shot some great photos! There is a theme, a story, and a red line in almost all of them! This is even emphasized by a few comments from the photographer. Alverson knows how to combine a photo with some meaningful lyrics. Even though they are few, they all hits the bulls-eye, so to speak. Anything negative? Well, not really, though I must admit that one of the poorest pictures off all is on the cover. Strange choice, I think! This book features pictures beginning from July 1973 and ending with the obvious June 26 1977. Keith Alverson from Georgia took several pictures of Elvis On Stage, mainly while he toured in the Southern states. Some of these photos are amazingly good! Especially the photos from Huntsville, May 31 1975 are astonishing! On the other hand - a great picture, though an awful one - look at page 80! This is a photo of Elvis in Charlotte, March 20 1976 (this concert is released on Running For President) during 'Polk Salad Annie'. Elvis has just chewed on a "cough drop" and his lips are blue... Awful! The photos from Atlanta 1976 on the other hand, leaves very little to be desired! A lot of these are already known (like many others in this book), but they are absolutely fascinating. You can see that Elvis is in high spirit and good shape, just like you can hear it on bootlegs from this short tour! The picture on page 100 is one of my all time favorites! I was kind of surprised by the pictures from Baltimore, May 29 1977. This was the awful "breakdown" concert, where Elvis had to leave the stage for over 20 minutes (please go to my Elvis On Tour 1977 section for more about this concert), and rumor has it that he collapsed right after the concert. On the two pictures from this show, Elvis look much better than suspected! (K. Alverson strangely enough finds this to be a good concert...well, he was there, and I wasn't). The book closes with some pictures from Macon June 1, Cincinnati June 25 and finally the last concert ever, Indianapolis June 26! The pictures quality is overall excellent in this book! 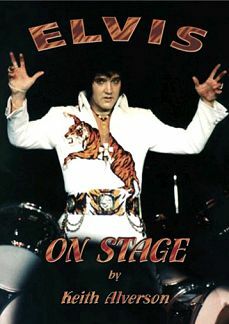 There have been released several good books with pictures of Elvis in concert during the later years. One must go way back in time to find anything as good as this one, however.